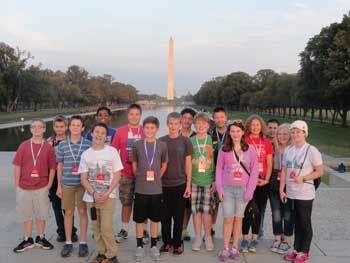 Templeton students travel to Gettysburg, Washington - Hamilton School District. An extended trip to Washington, D.C. and Gettysburg April 22-25 left 32 Templeton Middle School students, two parents and three teachers with unforgettable experiences. The school group traveled to Gettysburg and Washington, D.C., visiting battlefields and studying the impact the battle had on the war, Mount Vernon, U.S. Capitol, National 9/11 Pentagon Memorial, Holocaust Museum, several Smithsonian museums, the White House, U. S. Supreme Court, Library of Congress and many of the war memorials, including the Lincoln, Korean, Vietnam, Iwo Jima, Jefferson and Martin Luther King, Jr.
For many, a highlight of the trip was the visit to Arlington National Cemetery in Virginia. While there, Templeton students witnessed the changing of the guard at the Tomb of the Unknown Soldier. Following the guard-changing, Templeton students Cole Peske, Ian Turley, Bella Raykowski and Hang Yin had the honor and privilege of participating in the wreath-laying ceremony. The wreath was placed at the Tomb of the Unknown Soldier out of respect and honor for the many men and women who contributed to the freedom and democracy of the United States. The seventh and eighth grade students participating in the field trip included: Kyle Adrian, Maya Baldewicz, Austin Brown, Mitchell Buch, Sundeep Cheema, Alexia Duncan, Jacob Egloff, Noah Gierach, Matthew Gnanadass, Megan Gundrum, Hannah Kalis, Jerry Keith, Mary Kremer, Ann Marie Krolczyk, Kellie Kuehl, Joseph Lemen, Megan McGuire, Ariana Miller, Michel Mwanza, Amanpreet Nirwal, Alexandra Paque, Cole Peske, Kaitlyn Quam, Hannah Quimby, Bella Raykowski, Nicholas Schmidt, Gabriella Swearingen, Ian Turley, Jacob Wieseckel, Hang Yin, Tanner Yops and Brianna Zsakovics. Teacher chaperones included Anita Paque, Alan Schneider and Rhonda Watton.